Common asparagus beetles are active in asparagus fields at this time. 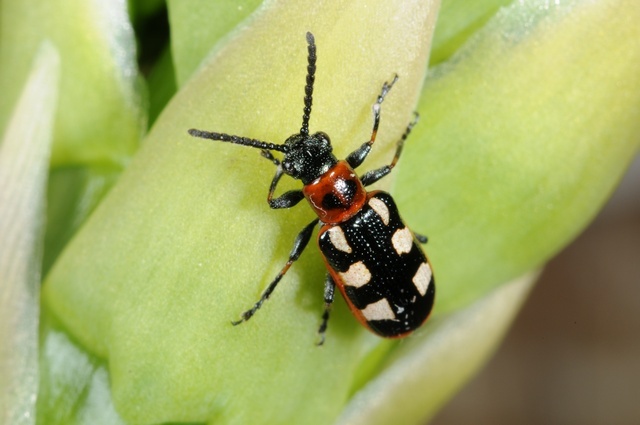 The spotted asparagus beetle tends to become active somewhat later in the spring. These two beetles are closely related and have similar life cycles but it is the common asparagus beetle that is most damaging to the cut spears. Common asparagus beetle (Crioceris asparigi) is blue-black, shiny, smooth and about 6 to 9 mm (1/4 inch) long, with three large yellow, squarish spots with red margins along each wing cover. (see photo). Eggs are black, laid standing on end in rows along the spears. Larvae are wrinkled, plump, hump-backed, and dull gray with black head and legs. They grow up to 1/3 inch. Spotted asparagus beetle (Crioceris duodecimpunctata) is reddish orange or tan, with six black spots on each wing cover (hence its other name, 12-spotted asparagus beetle). Eggs are greenish, glued singly on their sides to leaves. Eggs are laid on fronds, not on spears. Larvae are similar to those described above, but are orange colored, and feed primarily on berries. Both species of beetles feed only on asparagus. Winter habitat: Both species spend the winter as adult beetles. Sheltered sites such as under bark or in the stems of old plants are preferred. Some burrow into the soil. Thus they spend the winter in field borders, or within the asparagus planting itself. Life cycle: Beetles feed as soon as they become active, and begin laying eggs after several days of feeding. Eggs hatch in 3 to 8 days depending on temperature. Larvae feed for 10 to 14 days, molt four times, then crawl into the soil to form chambers in which they spin cocoons and pupate. After 5 to 10 days, new adults emerge. There are probably two generations in this part of New England. Scouting: At this time in the season, look for adult beetles, for feeding damage and for eggs laid on spears. Michigan State recommends a treatment threshold of 5-10% of the plants infested or 1-2% of the spears with eggs or damage. Cultural and biological controls. Overwintering populations may be reduced if last year's fronds and stalks are disked lightly or burned in the fall. Maintaining a clean environment in the fall will force beetles to seek shelter outside the field or burrow in the soil, where many predators reside. There are several beneficial insects that attack the asparagus beetle, including a tiny parasitic wasp (Tetrastichus asparagi) that attacks the egg stage. It kills eggs by feeding on them and by laying its own eggs, which hatch and grow inside the beetle eggs. Providing a nearby nectar source such as umbelliferous flowers for the wasps may increase their chances of survival, but until we can keep economic damage down with less toxic insecticides this may be futile. However, using well-timed applications based on scouting could make a difference in the survival of natural enemies. Chemical control. Scout fields regularly and apply an insecticide as soon as beetles become active or reach damaging levels (see 2002-2003 New England Vegetable Management Guide for recommended materials). Organic growers have the usual options for difficult-to-control beetles: tough it out; or use rotenone or pyrethrin (Pyganic Crop Protectant is allowable though difficult to get). When harvesting, pick the field clean to reduce the number of stems where eggs will survive long enough to hatch and grow up into summer-generation beetles. All insecticides listed in the Guide have a one day to harvest interval. Apply immediately after picking to allow harvest the following day.